Received: July 21, 2016; Revised: July 22, 2016; Accepted: August 16, 2016; Published online: November 30, 2016. CD44 pre-mRNA includes 20 exons, of which exons 1–5 (C1–C5) and exons 16–20 (C6–C10) are constant exons, whereas exons 6–15 (V1–V10) are variant exons. V6-exon-containing isoforms have been known to be implicated in tumor cell invasion and metastasis. In the present study, we performed a SR protein screen for CD44 V6 splicing using overexpression and lentivirus-mediated shRNA treatment. Using a CD44 V6 minigene, we demonstrate that increased SRSF3 and SRSF4 expression do not affect V6 splicing, but increased expression of SRSF1, SRSF6 and SRSF9 significantly inhibit V6 splicing. In addition, using a constitutive exon-specific primer set, we could not detect alterations of CD44 splicing after SR protein-targeting shRNA treatment. However, using a V6 specific primer, we identified that reduced SRSF2 expression significantly reduced the V6 isoform, but increased V6–10 and V6,8–10 isoforms. Our results indicate that SR proteins are important regulatory proteins for CD44 V6 splicing. In pre-mRNA splicing, introns are removed, and exons are ligated together to produce mRNA (1). Alternative splicing that produces multiple proteins from a gene plays an important role in gene expression. Alternative splicing occurs in ~95% of human genes. Thus it regulates various biological processes including cell cycle, energy transfer. Genetic diseases and cancers that are caused by abnormal RNA splicing (2–4). Both cis- and trans-acting elements are known to regulate alternative splicing. Cis-acting elements are RNA sequences that are located in exons or introns and function as splicing enhancers or inhibitors. Trans-acting elements are proteins or protein-RNA complexes that regulate alternative splicing. The best known trans-acting elements are heterogeneous nuclear ribonucleoprotein (hnRNP) and Serine-Arginine rich (SR) proteins (5, 6). The splicing-processing machinery, also known as the spliceosome, is composed of several proteins and U-small-nuclear RNP particles (snRNPs). The CD44 receptor directs intracellular signaling in cell growth motility through mediating adhesion and communications of cells with adjacent cells or the extracellular matrix. CD44 is a cell adhesion membrane glycoprotein. Ligands for CD44 determine CD44 functions. While growth factors modulate the growth-promotion function of CD44, hyaluronic acid mediates the tumor suppressor function of CD44 (7). Constant exons 1–5 (C1–C5), constant exons 16–20 (C6–C10) and various exons 6–15 (V1–V10) are included in CD44 pre-mRNA (8). The presence of variant exons leads to production of a large number of mRNA isoforms that encode proteins with different ligand-binding properties and diverse post-transcriptional modifications (9–11). Variant exons 6–15 are included or excluded to different extents to generate a great number of splicing variants. CD44 protein sizes ranged from 85 kDa (CD44s) to 250 kDa (CD44 V3–V10). V6 exon-containing isoforms play important roles in tumor cell invasion and metastasis. The V6 exon has been shown to be highly expressed in tumors compared with normal tissues. A CD44 V6 exon-containing isoform can make a complex with a tyrosine kinase receptor, Met, and hepatocyte growth factor, HGF, and then activate Met-dependent Ras signaling by the association of ezrin radixin-moesin (ERM) to CD44 on its cytoplasmic tail (12, 13). SR proteins are a protein family that includes 13 members -SRSF1-12 and tra2β SR proteins include a RNA recognition motif (RRM) domain and a RS domain (5). SR proteins play important roles in alternative and constitutive splicing. In constitutive splicing, SR proteins are known to promote the binding of U1 snRNP to 5′ splice-site and the binding of U2 snRNP binding to a branch-point in spliceosome assembly (14, 15). In alternative splicing, SR proteins are shown to antagonize hnRNP functions (16). SR proteins could promote exon inclusion or skipping through interactions with exons or introns. In addition to playing different roles in RNA splicing, SR proteins also function in transcription elongation, RNA stability, mRNA transport and mRNA translation (17). In the present study, we performed a SR protein screen for CD44 V6 splicing using overexpression and lentivirus-mediated shRNA treatment. Using a CD44 V6 minigene, we demonstrate that SRSF3 and SRSF4 do not affect V6 splicing. 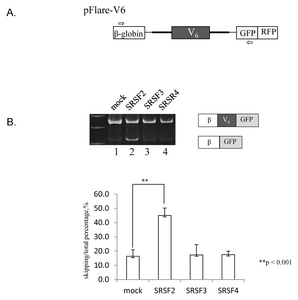 SRSF1, SRSF6 and SRSF6 significantly inhibits V6 splicing. In addition, using a constitutive exon-specific primer set, we could not detect alterations of CD44 splicing after SR protein-targeting shRNA treatment. Using a V6-specific primer, we identified that reduced SRSF2 expression significantly reduced the V6 isoform, but increased V6–10 and V6,8–10 isoforms. Our results indicate that SR proteins are important regulatory proteins for CD44 V6 splicing. In order to identify the SR proteins that affect V6 exon splicing of CD44 pre-mRNA, we used a MCF7 stable cell line that expresses the pFlare-V6 plasmid (18). As previously described, in the pFlare-V6 plasmid, V6 exon and its flanking introns are inserted between β-globin exon 1 and the GFP exon (Fig. 1A). GFP is expressed when V6 is skipped, and then RFP is expressed when V6 is included. To detect V6 exon splicing, we used a primer set that base pairs with β-globin and the GFP exon (Fig. 1A). Consistent with the previous results (18), the V6 included isoform was dominantly expressed, whereas the V6 excluded isoform was expressed at a much less significant level (lane 1, Fig. 1B). It was also consistent with the previously published conclusion (18) that SRSF2 significantly promotes a V6 skipped isoform and inhibits V6 inclusion. Next, we tested the function of SRSF3 and SRSF4 on V6 splicing. Although V6 exon and flanking introns include a number of potential binding sites for SRSF3 and SRSF4, Fig. 1B shows that neither SRSF3 nor SRSF4 affected V6 splicing. Thus we conclude that SRSF3 and SRSF4 are not regulatory factors for V6 exon splicing of CD44 pre-mRNA. We further asked whether other SR proteins regulate V6 exon splicing. We also noticed that V6 exon and flanking introns contain significant numbers of potential binding sequences for SRSF1, SRSF6, and SRSF9. These sequences suggest that the proteins may regulate V6 exon splicing. Therefore, we expressed SRSF1 or SRSF6 or SRSF9 in the pFlare-V6 cell line. Fig. 2 shows that, by contrast to SRSF3 and SRSF4, treatment of these proteins induced the V6 skipped isoform at significant level (~44%, ~36% and ~46% independently). Therefore, we conclude that SRSF1, SRSF6, and SRSF9 inhibit V6 exon splicing. We next wondered whether reduced expression of SR proteins could induce alteration of endogenous CD44 splicing. To address this question, we treated MCF7 cells using lentivirus-mediated shRNA and then extracted the RNA from cells. The standard primers that base pair with constitutive C5 and C6 exons were used to detect both the isoform that includes only constitutive exons (C) and the isoforms that include any variant isoform (V) (lower panel, Fig. 3). Consistent with the previously reported results (19, 20), RT-PCR results for CD44 splicing using these primers show that the C isoform was predominantly detected, whereas V isoforms were not detected (lane 1, Fig. 3). Moreover, non-silencing (NS) shRNA treatment did not induce any alteration of CD44 splicing (lane 2), suggesting that the NS shRNA can be used as a negative control. 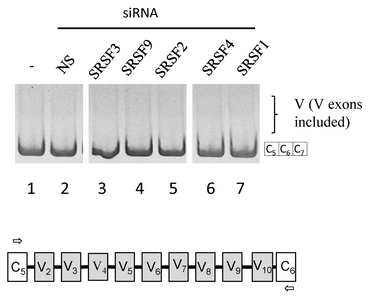 The results using shRNAs that target different SR proteins suggest that reduced expression of SRSF1, SRSF2, SRSF3, SRSF4, and SRSF9 did not induce production of any V isoform (lanes 3–7). The results are consistent with the conclusion that SRSF3 and SRSF4 did not affect CD44 splicing, but not with the conclusion that SRSF1, SRSF2, and SRSF9 regulate V6 exon splicing. As the primers could not detect various isoform containing isoforms, we determined to use one primer that base pairs with V6 exon and the other primer that base pairs with the C6 exon (lower panel, Fig. 4). The primers could detect V6–10 exon combinations, but not V2–V5. The Fig. 4 results show that the isoform that includes only V6 isoform among V6–10 was dominantly detected (V6, lane 1). In addition, an isoform that includes V6, V7, V8, V9 and V10 (V6–10) and an isoform that includes V6, V8, V9 and V10 (V6,8–10) were produced in less significant levels. We next asked whether reduced expression of SR proteins affects the expression of these CD44 isoforms. Fig. 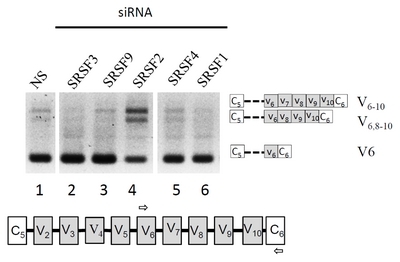 4 results demonstrate that reduced expression of SRSF3 and SRSF1 caused a decrease of V6–10 and V6,8–10 isoforms (lanes 2 and 6). Moreover, reduced SRSF9 and SRSF4 expression did not induce a significant change of CD44 isoforms. 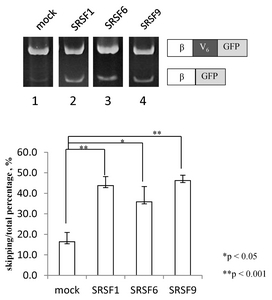 Most significantly, reduced expression of SRSF2 induced decreased expression of V6 but increased expression of both V6–10 and V6,8–10 expression. Our results suggest that SRSF2 is a key player in CD44 V6 splicing. CD44 pre-mRNA splicing is one of the most complicated splicing events in human genes. The CD44 pre-mRNA includes 10 constant exons, exons 1–5 (C1–C5) and 16–20 (C6–C10), and 10 various exons, exons 6–15 (V1–V10) (18–20). Here, we studied the function of SR proteins on V6 exon splicing of CD44 pre-mRNA. First, in the overexpression of SR proteins into the pFlare-V6- minigene-harboring MCF7 stable cell line, we demonstrated that SRSF1, SRSF6, and SRSF9 (but not SRSF3 and SRSF4) inhibit V6 exon splicing. Next, we analyzed the SR proteins function by reducing their expression levels through shRNA treatment. We found that, by using a primer set that base pairs with the constitutive exons of CD44 pre-mRNA, the changes of alternative splicing by SR proteins were not detectable. However, Using the primer that base pairs with the V6 exon, we show that SRSF2-targeting shRNA decreased the V6 isoform significantly, and also increased V6–10 and V6,8–10 isoforms. Our results indicate that CD44 V6 splicing is regulated by SR proteins. SR proteins have been known to function through binding to the enhancer to promote spliceosome assembly (21–23). Recently it was also reported that SR proteins can either promote or inhibit exon inclusion (24–26). In addition, using tethered SR proteins, it was demonstrated that splicing activation and repression by SR proteins depends on the location of their binding (27). Our results demonstrate that although all of the SR proteins we analyzed could potentially interact with V6 exon and flanking introns, only some of them could inhibit V6 splicing. Furthermore, the locations of SR protein binding did not affect their functions. The results can be explained that various potential binding locations of SR proteins on V6 exon and flanking introns could possibly function through combinatory or synergistically. How these combination or synergistic effects regulate alternative splicing has not been well understood. One of our most striking results is that reduced SRSF2 expression could induce various V6 exon-containing isoforms. Further study is need to determine the protein functions of these mRNA isoforms. Our results indicate that the SR proteins, whose overexpression showed inhibitory effects on V6 splicing, did not demonstrate significant effects as their expressions were reduced. This kind of quantitative differences have been reported in other studies (19, 20, 28). Another possibility is the assay systems in our experiments: While overexpression experiments were performed using a minigene-harboring stable cell line, shRNA treatments were performed by analyzing endogenous CD44 splicing. Another reason for differing results between the assay systems could be attributed to varying primer sequences used for analyzing V6 splicing of CD44 pre-mRNA. The results indicate that various exons in CD44 pre-mRNA should be detected using a primer that base pairs with itself. MCF7 cells were maintained in Dulbecco’s Modified Eagle’s Medium (DMEM; Hyclone) supplemented with antibiotics (100 U/ml penicillin G and 100 μg/ml streptomycin) and 10% of Fetal Bovine Serum (FBS; Hyclone) under humidified 5% CO2 conditions at 37°C. The stable pFlare-V6 stable cell was obtained as previously described (18). Different SR proteins plasmids were transfected into the stable cells using polyethyleneimine (PEI) Reagent according to the manufacturer’s protocol. Total RNAs were extracted using RiboEx reagent (GeneAll) following manufacturer’s protocol. RT-PCR was conducted as previously described (19, 20). For the endogenous CD44 pre-mRNA splicing, RT-PCR was conducted as previously described (29). A specific primer, CD44RT (5′-ATG CAA ACT GCA AGA ATC-3′) was used for reverse transcription. The following primers were used to detect CD44 splicing: primers for detection of pFlare-V6 stable cells [pFlareV6 Fwd (5′-GGA AGA GTT GGT GGT GAG G-3′), pFlareV6 Rev (5′-GGT GCA GAT GAA CTT CAG G-3′)], endogenous CD44 splicing [For (5′-AAG ACA TCT ACC CCA GCA AC-3′), Exon C7 Rev (5′-TTT GCT CCA CCT TCT TGA CTC C-3′)], V6 splicing [Fwd (5′-TCC AGG CAA CTC CTA GTA GT-3′), Exon C7 Rev (5′-TTT GCT CCA CCT TCT TGA CTC C-3′)]. The endogenous RT-PCR products were confirmed by sequencing. The shRNA lentivirus was prepared using different SR protein shRNA plasmid as previous described (19, 20). Knockdown of SR proteins was performed by treating cells with the virus for 72 h.
This work was supported by the NRF-2015R1A2A1A15054247 grant to Haihong Shen, the NRF-2016R1A2B1007135 grant to Xuexiu Zheng and Cell Logistics Research center (2016R1A5A1007318) funded by the National Research Foundation (NRF) of Korea, and an integrative aging research grant at the Gwangju Institute of Science and Technology (GIST). Fig. 1. SR proteins regulate V6 exon splicing of CD44 pre-mRNA. (A) pFlare-V6 minigene is shown. V6 exon is shown with a black box, β-globin and GFP/RFP exons are shown with white/gray boxes. Introns that flank V6 are shown with thicker lines, introns of β-globin and GFP are shown with thinner lines. (B) RT-PCR analysis using RNAs from pFlare-V6 MCF7 cells treated with pcDNA3.1+ or SRSF2 or SRSF3 or SRSF4. Quantitation results by Image J from three independent experiments are shown at the bottom. The significant change was evaluated by Student’s t-test. The error bars represent the standard deviation of the repeats. Fig. 2. SRSF1, SRSF6, and SRSF9 inhibit V6 exon splicing. RT-PCR analysis using RNAs from pFlare-V6 MCF7 cells treated with pcDNA3.1+ or SRSF1 or SRSF6 or SRSF9. Quantitation results by Image J from three or more independent experiments are shown at the bottom. The significant change was evaluated by Student’s t-test. Results are expressed as percentages of ratio skipping V6/total. The error bars represent the standard deviation of the repeats. Fig. 3. Using a primer set that base pairs with constitutive exons could not detect the induction of the various exon-included isoforms obtained by reducing SR protein expression. (Upper panel) RT-PCR analysis using RNAs from cells treated with shRNA viruses that target SRSF3, SRSF9, SRSF2, SRSF4 or SRSF1. Non-silencing shRNA was used as a control. The identities of spliced products are shown at right. (Lower panel) primers used in RT-PCR analysis are shown with arrows. Fig. 4. Using V6 exon-specific primer could detect the induction of various exon-included isoforms by reduced SRSF2. (Upper panel) RT-PCR analysis using RNAs from SR protein-targeting shRNA viruses treated cells. The identities of the spliced products are shown at right. (Lower panel) primers used in the RT-PCR analysis are shown with arrows. Green, MR (1986). Pre-mrna splicing. Annu Rev Genet. 20, 671-708. David, CJ, and Manley, JL (2010). Alternative pre-mRNA splicing regulation in cancer: Pathways and programs unhinged. Genes Dev. 24, 2343-2364.
Cooper, TA, Wan, L, and Dreyfuss, G (2009). Rna and disease. Cell. 136, 777-793. Kim, E, Goren, A, and Ast, G (2008). Insights into the connection between cancer and alternative splicing. Trends Genet. 24, 7-10. Busch, A, and Hertel, KJ (2012). Evolution of sr protein and hnrnp splicing regulatory factors. Wiley Interdiscip Rev RNA. 3, 1-12. Han, SP, Tang, YH, and Smith, R (2010). Functional diversity of the hnrnps: Past, present and perspectives. Biochem J. 430, 379-392. Herrlich, P, Morrison, H, and Sleeman, J (2000). Cd44 acts both as a growth- and invasiveness-promoting molecule and as a tumor-suppressing cofactor. Ann N Y Acad Sci. 910, 106-118. Screaton, GR, Bell, MV, Bell, JI, and Jackson, DG (1993). The identification of a new alternative exon with highly restricted tissue expression in transcripts encoding the mouse pgp-1 (cd44) homing receptor. Comparison of all 10 variable exons between mouse, human, and rat. J Biol Chem. 268, 12235-12238. Bennett, KL, Jackson, DG, and Simon, JC (1995). Cd44 isoforms containing exon v3 are responsible for the presentation of heparin-binding growth factor. J Cell Biol. 128, 687-698. Orian-Rousseau, V, and Ponta, H (2008). Adhesion proteins meet receptors: A common theme?. Adv Cancer Res. 101, 63-92. Tremmel, M, Matzke, A, and Albrecht, I (2009). A cd44v6 peptide reveals a role of cd44 in vegfr-2 signaling and angiogenesis. Blood. 114, 5236-5244. Orian-Rousseau, V, Chen, L, Sleeman, JP, Herrlich, P, and Ponta, H (2002). Cd44 is required for two consecutive steps in hgf/c-met signaling. Genes Dev. 16, 3074-3086. Legg, JW, and Isacke, CM (1998). Identification and functional analysis of the ezrin-binding site in the hyaluronan receptor, cd44. Curr Biol. 8, 705-708. Boukis, LA, Liu, N, Furuyama, S, and Bruzik, JP (2004). Ser/arg-rich protein-mediated communication between u1 and u2 small nuclear ribonucleoprotein particles. J Biol Chem. 279, 29647-29653. Shao, W, Kim, HS, Cao, Y, Xu, YZ, and Query, CC (2012). A u1–u2 snrnp interaction network during intron definition. Mol Cell Biol. 32, 470-478. Bai, Y, Lee, D, Yu, T, and Chasin, LA (1999). Control of 3′ splice site choice in vivo by asf/sf2 and hnrnp a1. Nucleic Acids Res. 27, 1126-1134. Zhong, XY, Wang, P, Han, J, Rosenfeld, MG, and Fu, XD (2009). Sr proteins in vertical integration of gene expression from transcription to RNA processing to translation. Mol Cell. 35, 1-10. Loh, TJ, Moon, H, and Cho, S (2014). Sc35 promotes splicing of the c5-v6-c6 isoform of cd44 pre-mRNA. Oncol Rep. 31, 273-279. Mi, Y, Zhang, C, and Bu, Y (2015). DEPDC1 is a novel cell cycle related gene that regulates mitotic progression. BMB Rep. 48, 413-418. Han, A, Chae, YC, Park, JW, Kim, KB, Kim, JY, and Seo, SB (2015). Transcriptional repression of ANGPT1 by histone H3K9 demethylase KDM3B. BMB Rep. 48, 401-406. Sun, Q, Mayeda, A, Hampson, RK, Krainer, AR, and Rottman, FM (1993). General splicing factor sf2/asf promotes alternative splicing by binding to an exonic splicing enhancer. Genes Dev. 7, 2598-2608. Chandler, SD, Mayeda, A, Yeakley, JM, Krainer, AR, and Fu, XD (1997). Rna splicing specificity determined by the coordinated action of RNA recognition motifs in sr proteins. Proc Natl Acad Sci U S A. 94, 3596-3601. Anko, ML, Morales, L, Henry, I, Beyer, A, and Neugebauer, KM (2010). Global analysis reveals srp20- and srp75-specific mrnps in cycling and neural cells. Nat Struct Mol Biol. 17, 962-970. Pandit, S, Zhou, Y, and Shiue, L (2013). Genome-wide analysis reveals sr protein cooperation and competition in regulated splicing. Mol Cell. 50, 223-235. Simard, MJ, and Chabot, B (2002). Srp30c is a repressor of 3′ splice site utilization. Mol Cell Biol. 22, 4001-4010. Han, J, Ding, JH, and Byeon, CW (2011). Sr proteins induce alternative exon skipping through their activities on the flanking constitutive exons. Mol Cell Biol. 31, 793-802. Erkelenz, S, Mueller, WF, and Evans, MS (2013). Position-dependent splicing activation and repression by sr and hnrnp proteins rely on common mechanisms. RNA. 19, 96-102. Bielli, P, Bordi, M, Di Biasio, V, and Sette, C (2014). Regulation of bcl-x splicing reveals a role for the polypyrimidine tract binding protein (ptbp1/hnrnp i) in alternative 5′ splice site selection. Nucleic Acids Res. 42, 12070-12081.
van Weering, DH, Baas, PD, and Bos, JL (1993). A PCR-based method for the analysis of human cd44 splice products. PCR Methods Appl. 3, 100-106.